Will the President of the United States be responsible for lowering power prices in New Zealand? That question has been raised because this could be one of the unintended consequences of Donald Trump’s latest move “to make America great again”. Bringing jobs back to the manufacturing industries in America’s Rust Belt states was one of his key election campaign promises. As a result, the President has now declared war on steel and aluminium imports, which he believes are undermining American producers. His intention is to increase the competiveness of domestic steel and aluminium manufacturing, by making imported products more expensive – through the imposition of a 25 percent tariff on imported steel and 10 percent tariff on imported aluminium. The executive order was issued under an obscure section of American trade law, which enables the President to impose tariffs on imports that pose a threat to US security. With some three percent of US aluminium and steel production being used for military purposes, President Trump has argued that the steel and aluminium industries are vital to national defence. In 2017, the US manufactured 82 million metric tons of steel and imported 30 million tons of foreign steel, mainly from Canada, Brazil, South Korea, Mexico and Russia. In 2016, they manufactured 840,000 tons of aluminium, and imported 4.7 million tons, mainly from Canada, Russia, United Arab Emirates, and China. Since the original tariff announcement, the President has softened his stance, by suggesting the possibility of exemptions for countries that deliver benefits to the US. In particular, he’s said that if the US can finalise a favourable North American Free Trade Agreement with Canada and Mexico, they will be excluded from the tariff. Some believe the President’s new tariffs will start a trade war as countries seek to retaliate. There are also major concerns that there will be a substantive impact on steel and aluminium producers around the world – including New Zealand – as countries which currently export to the US look elsewhere to reduce the price cut they would face, depressing prices globally. According to Trade Minister, David Parker, who has ruled out any form of retaliation, New Zealand’s iron and steel exports to the US were worth $39 million last year out of a total of $433m, while aluminium exports were worth $23m out of a total of $1.1 billion. Steel in New Zealand is produced at Glenbrook, south-east of Auckland, and aluminium, at Tiwai Point, near Bluff in Southland. It’s the impact of President Trump’s tariffs on aluminium production that could affect our power bills. 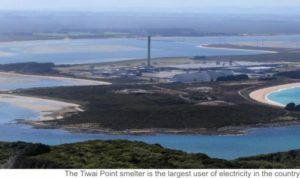 The Tiwai Point smelter is owned by New Zealand Aluminium Smelters – a joint venture between the Australian and British Rio Tinto Group, and the Japanese Sumitomo Group. Established in 1971, it imports alumina from Queensland and the Northern Territories and processes it into aluminium nuggets. Some 90 percent is exported, mainly to Japan and the Asia Pacific region, with just two percent going to the USA. Since aluminium manufacturing requires a large and very reliable power source to continually supply electricity to the reduction cells, smelters are only viable when they have access to an abundant source of inexpensive energy. Tiwai Point’s location near Bluff was therefore dependent upon the construction of the Manapouri hydro power station and the promise of cheap power by the New Zealand government. The smelter uses 13 percent of the country’s electricity supplies and accounts for 10 percent of the Southland region’s economy. It employs 800 full-time workers, and is responsible for a further 3,000 indirect jobs. Over the years, the economics of aluminium production – which largely depends on the price of alumina, the cost of power, and the exchange rate – has fluctuated widely, with the company threatening closure in 2013 as a result of falling profitability. In response, the National Government offered a massive taxpayer-funded $30 million subsidy to keep the smelter operating. Their agreement was on the condition that it would have to continue operating until at least January 2017. The smelter also signed a contract with Meridian Energy for the continuous supply of 572 megawatts of cheap electricity for the period from 2013 to 2030. In 2015, a variation of their agreement enabled other generators, including Contact Energy and Genesis Energy, to contribute 172 MW of that total. Under that agreement, each year, New Zealand Aluminium Smelters has the right to review its operation and terminate the contract – or reduce its electricity demand to 400 MW with one year’s notice. While only a small proportion of the aluminium produced at Tiwai Point is exported to America, if the changes introduced by President Trump depress prices globally, the future viability of the smelter may again be under threat. So what does this have to do with your electricity bill? Since Tiwai Point uses around 13 percent of New Zealand’s total electricity production, if the plant was to close, an abundance of cheap hydro-power would then become available for other consumers, at lower prices. It’s not quite that simple, of course. Because Tiwai Point is at the bottom of the South Island and the majority of electricity demand is at the top of the North Island, some transmission difficulties would need to be addressed. Furthermore, the power companies – which are all listed on the New Zealand Stock Exchange and have maximising profits to shareholders as a key objective – are likely to try to minimise potential losses by cutting back on production. However, in the short term, power prices would undoubtedly ease. Whether any of this eventuates of course, is not clear, but it remains a distinct possibility given the precarious economics of aluminium production. So what is the current state of power prices in New Zealand? When National was first elected to Government in 2008, then Energy Minister, Gerry Brownlee, launched a major review aimed at bringing power prices – which had increased by 78 percent between 2000 and 2008 – under control. Amongst other things, the resulting package of reforms made it easier for consumers to switch power providers and shop around for the best pricing deals. As a result of these changes, Ministry for Business, Innovation and Employment figures show that while power prices have risen by around 6 percent above inflation since 2012, because household power usage has reduced – mainly due to more energy-efficient appliances and better insulated homes – spending on electricity has somewhat stabilised: In 2012, the average household expenditure was $2,074 for 7,609 kilowatt hours, and in 2017 it was $2,029 for 7,046 kWh. Our power bills reflect the contribution that the different system operators make towards delivering electricity to our homes. These operators include the Electricity Authority regulator, five major generators – Contact Energy, Genesis Energy, Mercury Energy, Meridian Energy and TrustPower, Transpower’s national grid of almost 12,000 kilometres of high voltage transmission lines, local power line distribution networks operated by 29 lines companies, and an increasingly competitive range of power retailers. As a result, over 30 percent of our bill goes to the generators, 26 percent to the distributors, 16 percent to the retailers, around 10 percent pays for transmission charges, 4 percent for governance and meter reading – and on top of that we pay the Government GST. Around 85 percent of New Zealand’s electricity supply comes from renewable sources – predominantly hydro, with geothermal, wind and solar power. That’s the third-highest proportion in the OECD, behind Norway and Iceland. When in Government, National adopted the former Labour Government’s target of 90 percent renewable energy generation by 2025. The new Labour led coalition has upped the ante – they want 100 percent renewable energy generation by 2035. But there are major challenges in achieving a total reliance on renewable energy – namely, what do you do in dry years, when the hydro lakes are low, the wind doesn’t blow, and the sun doesn’t shine? Those other countries that are more dependent on renewable energy than New Zealand have greater back-up capacity. Norway has two years of storage in its lakes, compared to New Zealand’s six-to-eight weeks, and Iceland, not only has huge reserves of untapped potential in lakes, but also in geothermal fields. Whether the environmental lobby likes it or not, New Zealand needs to include back-up fossil-fuel generation – in the form of the Huntly coal-fired power station – in our energy network, to provide security of supply and to ensure the lights are kept on. “Transpower’s 2017 review of system security – based on an optimistic assessment of peak demand and the ability of thermal generators to make up the dry year shortfall – is sobering. It warns of an increasing risk of short blackouts whenever there is insufficient generation to meet peak demand and much longer blackouts due to lack of hydro generation in a dry year. In 2015, Genesis Energy, the company that owns Huntly, announced it was no longer economic to run. However, this raised such concern amongst generators and Transpower, about the security of supply if back-up generation was not available, that multi party negotiations were held, and in 2016, Genesis announced that Huntly would continue to operate until 2022. Following on from this, last month, Genesis announced that Huntly will now operate until at least 2030, with coal being phased out under normal market conditions by 2025, but available as a system back-up after that. The Climate Change Minister, Green Party leader James Shaw responded by saying he was not concerned: “We want to get out of fossil fuels by 2035. I think the Genesis announcement is consistent with that”. But the idealistic commitment to 100 percent renewable energy is based on wishful thinking – unless new hydro dams are built, vast new geothermal generation capacity discovered, or batteries invented that can store unlimited power, New Zealand will always need coal or gas generation as a backup, to ensure the security of our electricity system. Government policy should reflect reality, rather than idealism. Meanwhile, the new Minister of Energy, Dr Megan Woods, has announced a review of electricity prices in New Zealand. This will deliver on Labour’s coalition commitment to New Zealand First to “hold a full-scale inquiry into retail power pricing”. But back to where we began – if the new US tariffs depress the aluminium market to the point where the profitability of the Bluff smelter is undermined and it is forced to close, the country would be awash with cheap electricity – and President Trump would have brought a new era of lower power prices to New Zealand! Do you believe it is realistic for the Government to aim for 100 percent dependence on renewable energy generation in New Zealand? The dreaming green party will always demand unrealistic goals. We can’t rely solely on rainfall fed hydro generation for all our electricity. NZ does very well achieving the level of renewable at 80 to 90 %. Let the greens go and ride bikes and abolish all vehicles, normal Kiwis are not returning to the horse and cart age of 150 years ago. Chris. South Australia tried & failed miserably. N.Z. has vast coal reserves, some of which are being exported. Time to utilise our natural resources,[put the chimney emissions through scrubbers], & make N.Z. great again… With the Tiwai Point smelter being in-part Australian owned, very little effect will felt because of the security agreement with the U.S… A.G.R. Idealistic aim but 100% is always a ridiculous target.